These crisp and cheesy Toasted Pesto Egg Breakfast Sandwiches create a unique twist on traditional bacon & eggs and are sure to become a morning favorite! In September I went on a week-long sailing trip in Croatia. What a beautiful part of the world! If you are into sailing, or actually just into traveling for that matter, definitely put Croatia on your list!! When you are on a long sailing trip you need to get a little creative with food at times. You start the trip with the provisions you selected based on your meal planning and then you’re pretty much stuck with those for the duration. And like all things, even with the best planning intentions, sometimes you end up having to improvise. Towards the end of the week we were reviewing our remaining provisions and realized we had some oddball items that hadn’t been used. It was time to get a bit creative! Before we get into the recipe, I wanted to share a couple of my favorite photos from the trip. We started our trip in Split and sailed from island to island each day, stopping either to anchor or find a mooring at night. Some of the views are simply breath-taking. This is the harbor on the Island of Vis. And this is our mooring for one night just outside of the main harbor on Hvar. You couldn’t pick two places that are more different – Vis is a quaint little village while Hvar is better known for its restaurants and night clubs. Both are very popular boating destinations in Croatia. So, back to the egg sandwiches. On the trip, pesto was the ingredient we were trying to use up. As often happens with many dishes, the idea for these sandwiches went through a couple of iterations. They actually started out as grilled cheese sandwiches, but ultimately this awesome pesto egg breakfast sandwich was born! Let’s talk about bacon + eggs for a minute. I use real bacon in this recipe – I just can’t resist the crisp crunch of perfectly cooked bacon, it’s one of my favorite breakfast foods! My theory is, I’d rather use the real thing and keep the indulgence to a once in a while things! If you prefer, you can use turkey bacon, or just leave the meat out if you want to make it a meat-free meal. So you might be asking what about the pesto? When I make a batch of pesto I freeze some in ice trays so I have it on hand for recipes like this. If you don’t have any homemade pesto you can definitely use store-bought instead. I love this combo of eggs, pesto, bacon and gouda, however as we learned on the boat, sometimes getting creative with ingredients is a great way to use something up, so check your refrigerator and cabinets and see if there is an “extra” ingredient you want to add to this sandwich to make it your own. You’ll end up with a truly unique breakfast sandwich! 10″ non-stick skillet – A high-quality non-stick skillet is a kitchen necessity and is key for making crispy toasted sandwiches, quesadillas and many other things. 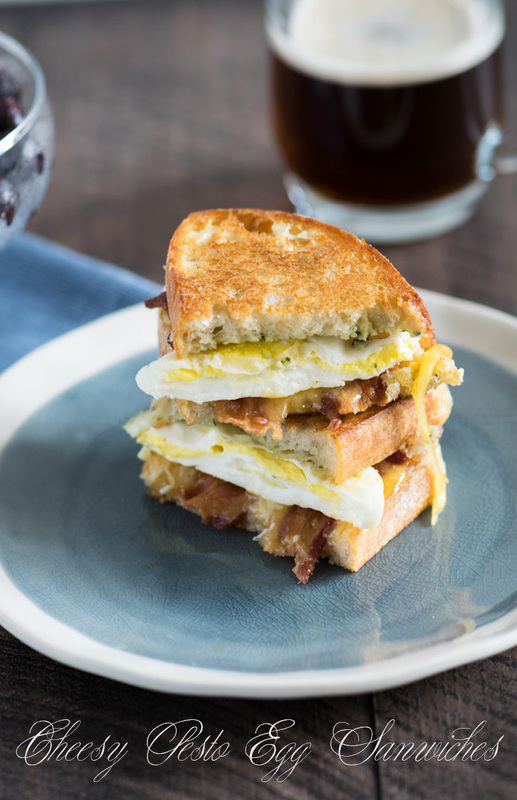 These crisp and cheesy Toasted Pesto Egg Breakfast Sandwiches create a unique twist on traditional bacon and eggs and are sure to become a morning favorite! Spray a medium non-stick skillet with cooking spray or lightly coat with butter. Heat pan over medium heat. Crack the eggs into the pan and cook for 1 minute. Lightly pierce the yolk of each egg with the corner of a spatula. Cook for an additional minute. Carefully flip the eggs. It’s OK if they fold over slightly. Cook for 1 more minute. Spread the pesto on the non-butter side of two slices of the bread and place in the pan, buttered side down. top with egg, bacon and cheese. Place the additional slice of bread on the top of each sandwich, with the buttered side facing out. Cook for 2-3 minutes until golden brown. Carefully flip the sandwiches and cook for an additional 2-3 minutes. Remove from the pan and serve immediately. These sandwiches look so yummy! I am quite impressed by the combination of pesto, eggs and bacon. Definitely a must try! Sailing through Croatia is very high on my list of must-do travel experiences. It looks beautiful. I love how necessity drives invention, and that you managed to create something so delicious out of such humble ingredients. **drool** eggs, pesto, bacon, and gouda are all part of my happy place! This combination is lovely! Also, your photos of Croatia are stunning. I can just only imagine waking up to that view with this breakfast. Perfection! I’ll be sure to try it out soon! What a great idea! Sourdough bread is my favorite, it looks great! What delicious looking and sounding sandwiches. Pesto and egg is a divine combo and I just happen to have some pesto in the fridge so will most certainly be making these. And what an amazing trip that must have been – stunning photos! Thanks Lis! I hope you enjoy them! I freaking love breakfast sandwiches. These look flavorful and delicious. Pesto? Brilliant touch. This reminds me of my youth. I remember egg sandwiches and I loved them. I don’t know why we don’t make them more often now that we’re older. Now, I would consider these comfort food! Oh wow! I am going to Croatia in a couple of months and i would love your recommendations on places to eat, cities to visit and sights to see. As for this sammy. . .wow! I would love to see this show up in my landlocked kitchen. Such a truly gourmet brekky especially when considered it was prepared on a sail boat. Oh, so many things to do in Croatia Lynn! I’d definitely put Split, Hvar, Trogir & Dubrovnik on your list of places to go! A perfect weekend brunch sandwich with all of my favorite ingredients! Sooo good!